Happy Monday, y’all! Here’s our last tangle for April 2018 … and Xo is one from my archives. I’ve been doing one of my regular reviews and unearthed a few that deserve to be featured. 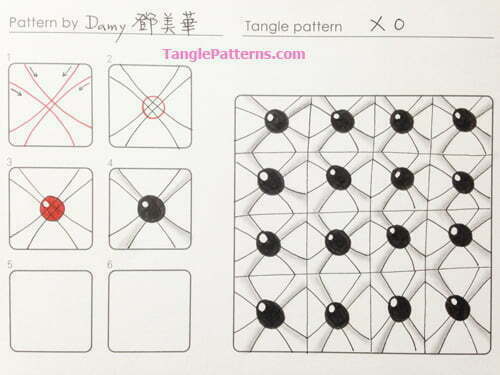 Today Taiwan quilter and CZT Mei Hua Teng (Damy) shares her cool and super easy Xo tangle with us. Damy already has two dozen great tangles on the site and Xo is another good one to add to our repertoire. Damy notes that Xo is a combination of CZT Pegi Schargel’s B’Twined, and CZT MaryAnn Scheblein-Dawson’s Chemystery tangles. It’s another tango! And as it’s name suggests, it’s composed of an X and an O. That’s it. Xo is another one of those tangles where a touch of pencil shading makes a huge difference to the finished art. Sometimes you can get away with just using your tortillion if it has enough residual graphite on it. Damy illustrates the step-by-step instructions for drawing Xo below and she features it in a cool minimalist monotangle Zentangle® tile. Great filler and a fun tangle…! I love the simplicity of this one! Elegant and fun, thanks for sharing. Nice. will be a fun filler. Thank you for this bold, simple tangle! By varying the distance between curves, the size of the “pearls” can be varied as well. Fun to play with!